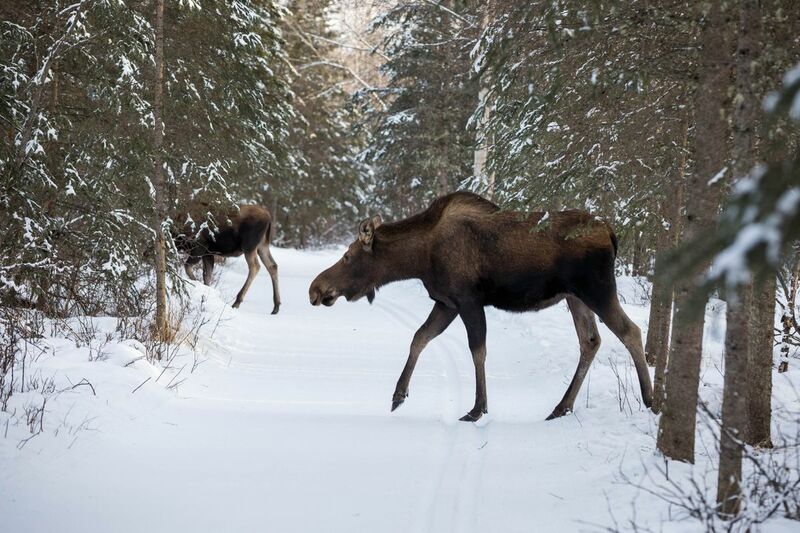 Wildlife biologists are asking Anchorage residents to be on the lookout for moose this weekend as they try to get a grasp on the size of the population. Starting Friday, biologists from the Alaska Department of Fish and Game will canvass the Anchorage Bowl in hopes of determining how many moose are roaming the city. They will search until Sunday evening across an area that extends from Joint Base Elmendorf-Richardson in the north to Potter Marsh in the south, they said. The moose count, now in its second official year after a successful “test count” in 2017, informs how the agency manages the moose population. That includes everything from the number of hunting permits the department gives out to how it tracks vehicle collisions to the recommendations it makes for building fences, according to area biologist Dave Battle. “It’s part of the big puzzle, and it’s one of the most basic bits of information that we can relate all these other things we do to," Battle said. While biologists will be the ones going out and cataloging the moose, they said they’re relying on residents to point them in the right direction. The department is asking members of the public to call 907-267-2530, text 907-782-5051 or report online at adfg.alaska.gov if they see a moose this weekend. Moose-spotters should report the location of the moose, the time it was seen and how many were observed. “This project would be dead in the water without the public," Battle said. During the 2017 “test run” count, the agency fielded more than 600 calls from members of the public who had spotted moose. Last year, it was more than 500, biologists said. Last year’s final count sat at 143 moose, so many of these callers were reporting the same moose, said wildlife biologist Dave Saalfeld. The biologists caution moose-spotters to keep their distance from any moose they might see and watch for body language that may indicate stress, like hair standing up on the moose’s hump or ears flattening. This year’s count is special, biologists said, because it’s the first year they expect to get a true population estimate, rather than just a minimum count. Last year, they were only able to say there were “at least” 143 moose in Anchorage, but by combining this year’s count with last year’s, they will be able to get a clearer picture of the actual population size, Saalfeld said. “Each year’s number will get tighter and tighter the more years we do this,” Saalfeld said. 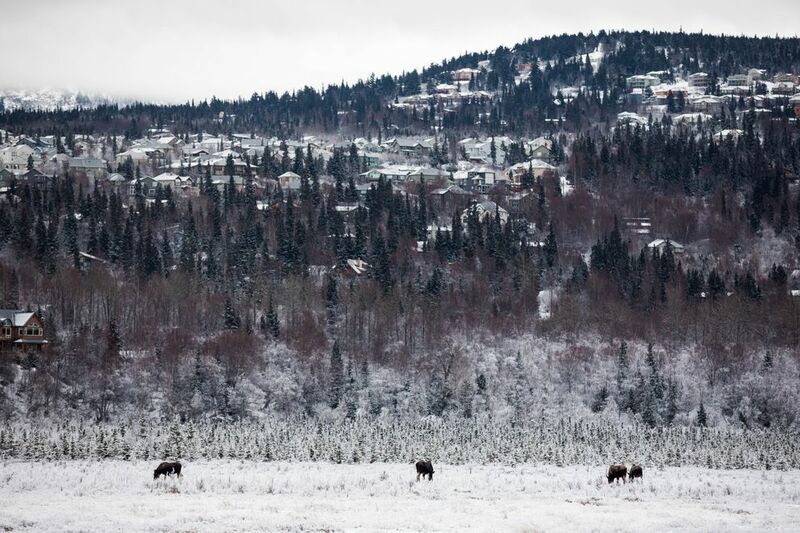 In the past, the size of the moose population in Anchorage has only been a guess, Battle said. Normally, moose surveys have to be done from the air from early in the winter so that biologists can easily spot the animals against the snow, but Anchorage’s congested airspace and increasingly warm winters make aerial counts impossible. It wasn’t until two years ago that biologists first were able to do ground counts in Anchorage. Their new method allows them to shoot a dart that collects a small amount of tissue from the moose without harming it. The DNA sample they collect allows biologists to identify how many individual moose have been spotted, as well as what the population’s male-to-female ratio is. Once information from this year’s count is available, Saalfeld said, biologists may be able to start to get a handle on other questions as well, like how many moose move into the city during the winter and what triggers them to move. Contact: Between 8 a.m. and 5 p.m., call the Alaska Department of Fish and Game at 907-267-2530, text 907-782-5051 or report moose sightings online at adfg.alaska.gov. You don’t need to stay near the moose until wildlife biologists arrive; you only need to report where you saw the moose, how many moose there were and when you spotted it.